Soil management has undeniable effects on crops, farms, and the environment. “Soil Balancing,” (SB) based on base cation saturation ratios, is one major approach to soil management, that is practiced widely by organic farmers, but for which the research base is relatively small and mostly unsupportive of the use of soil balancing. Through surveying growers and conducting experiments and interviews, a multidisciplinary team at Ohio State is working to develop a more complete and widely-shared understanding of SB. That understanding will help move the science and practice of SB forward, allowing people to apply and study SB principles and practices more effectively. These phone-in events will continue the conversation about the basis and practice of Soil Balancing. Please join us to listen, learn, and contribute. Resource people will be on hand to provide input, but we also wish to hear from callers and learn from their experiences. Send in your question or comment before or during the call-in. 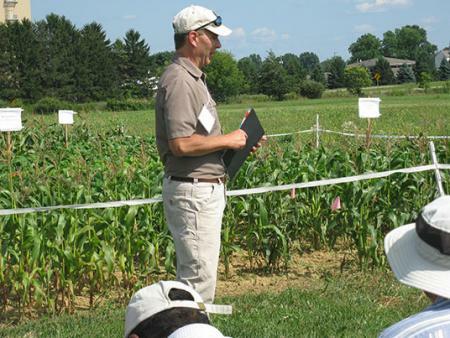 Learn the basics about Soil Balancing and how Ohio State is researching it. Description: The history and current use of Soil Balancing provides a rich opportunity to examine the different ways that farmers and scientists develop and use their knowledge. Join us to discuss what the concept and practice of Soil Balancing currently means to farmers, researchers, and consultants, and to brainstorm ways in which improved soil management can strengthen sustainably-minded farm management. Soil Balancing: What do the Numbers Say about its Effects on Soils, Crops, Weeds, and Farms? Description: Everyone uses numbers to make decisions, although the numbers people have and the ways they use them often differ. These differences can spell both excitement and challenge when trying to understand and use Soil Balancing. Join us to discuss Soil Balancing by the numbers, as farmers, consultants, and researchers discuss the numbers we have and the numbers we wish we had. Description: “You don’t know enough to know what you need to know.” This recent recollection by a farmer after their encounter with a more experienced one reminds us that the questions matter. Much is said, written, and claimed about Soil Balancing but all is still not clear about it. If there is to be a more useful knowledge base about Soil Balancing—shared by farmers, consultants, and researchers alike—new questions and new ways of addressing them must be shared and accepted by many. Join us to discuss and shape where investigations of Soil Balancing should go next and how. Once registered, you will receive call-in instructions by email. Dial in the day of the broadcast to listen live to the conversation. Participants may send in questions before, during, and after each scheduled conversation. Send to moderator Matthew Kleinhenz at vegprosystemslab@gmail.com. The team will begin with some basic conversation on the day’s topics. Then we’ll start incorporating participant questions and comments. If you have trouble accessing the online registration form, contact Stephanie Short, at short.189@osu.edu or (330) 202-2555 ext. 2687. Each Conference Call-in will feature Ohio State researchers and specialists, as well as partner farmers, and consultants in the field. We hope to represent a diverse range of viewpoints, knowledge bases, and experiences in each week’s groups. Confirmed panelists include: Steve Culman (Ohio State soil fertility specialist), Doug Doohan (Ohio State weed specialist), Will Glazik (Cow Creek Organic Farm), Doug Jackson-Smith (Ohio State Environment and Natural Resources), Bob Jones, Jr. (The Chef’s Garden), John Kempf (Advancing EcoAgriculture), Matthew Krause (BioWorks), Josh McGrath (University of Kentucky), Bill McKibben (Soil Tech, Inc), Joe Nester (Nester Ag, LLC), Eric Pawlowski (OEFFA), and James Schiltz (Midwestern BioAg). This work is supported by Organic Agriculture Research & Extension funding grant no. 2014-51300-22331/project accession no. 1003905 from the USDA National Institute of Food and Agriculture. Slide Presentations: Is it Important to Manage the Calcium: Magnesium Ratio in Soils?